If you’re a cheese fan then this barbecue Camembert cheese is made for you - the perfect way to finish off a great BBQ party. Camembert is a soft white French cheese made from cow's milk and it has a white crust encasing it. The trick to making this barbecue Camembert cheese recipe work and indeed whenever you are planning Camembert on the menu is to make sure that the cheese is ripe. You'll see many folks taking the wooden lid off the pack and pressing the center of the cheese to see if it is soft - this is wrong. Mainly because if enough people prod the same cheese in the same place it is inevitably going to be soft so the test is meaningless. The right way to test whether the cheese is ripe is to squeeze it across the diameter and judge the softness. If there's no "give", put it back or buy it and be prepared to wait 2 weeks before you use it. It's better to have a ripe cheese for this recipe because you want the more mature flavour but because we are going to melt the cheese over the grill you can get away with Camembert that's slightly less ripe. One final point when buying Camembert is to ensure that it states "Au lait cru" on the box. This means that it is made from unpasturised milk and therefore has the best flavour. Peel the garlic cloves and chop finely (or crush). Soften the butter in a dish (don't melt otherwise the solids will separate) and then fold in the chopped garlic and parsley. Put the garlic butter in the refrigerator for 10 minutes just to firm it up a little and whilst underway slice the bread on the diagonal but not all the way through leaving the baguette partially attached at the bottom. 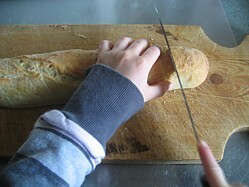 With a flat knife apply the garlic butter between the bread slices and the wrap the baguette in foil. Now to the Camembert; open the wooden carton, take the cheese out and remove the wax paper. 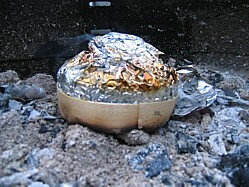 Wrap the Camembert in foil reasonably tightly to preserve the diameter of the cheese and lay it in the charcoal embers of your barbecue grill along with your foil wrapped bread and just leave these parcels to gently warm through which will take about 15 - 20 minutes. 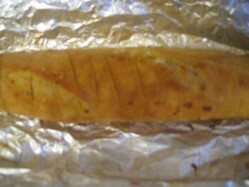 Turn the bread after 10 minutes to ensure that it doesn't burn. The reason for the tight wrap on the cheese is so that it doesn't lose shape whilst on the coals because the next step is to put your barbecue Camembert cheese back into the wooden carton for presentation and serving. Your tightly wrapped Camembert should now slot nicely back into the wooden carton. For a little extra theatre before serving I like to replace the wood carton and cheese back on the coals for 5 minutes just to char the wood a little. The operative word being "char" rather than "set alight" so if you choose to do this then stay with your cheese otherwise you can end up with a fireball. When the main course is finished and you’re ready with a glass of red, break open the cheese and bread parcels and spoon the creamy gooey melted Camembert onto garlic bread and whatever you do, don’t count the calories!